T-Mobile is kicking off the first-ever BOGObonanza, a promotional offer with major discounts on no less than twelve popular smartphones, including the Samsung Galaxy S9, Galaxy S8, iPhone 8, and LG V30. Motorola is part of the promotion as well, but it does not offer BOGO (buy one get one free) deals on any of its smartphones. However, customers who are looking for a Moto smartphone, specifically the Moto Z2 Force Edition, will be pleased to know that T-Mobile has a great deal on the handset. For a limited time, the Moto Z2 Force Edition is available for just $375, so anyone purchasing the phone will save $375. 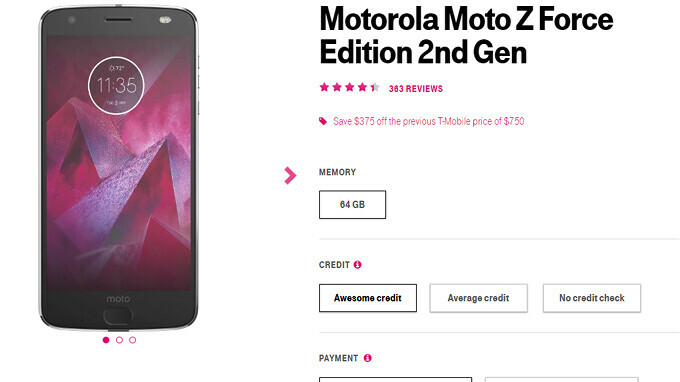 Motorola's high-end smartphone can also be bought for $15 down and $15 per month for 24 months. Plus, if you activate the Moto Z2 Force Edition with T-Mobile, you'll also receive free express two-day shipping. Just make sure to use the promo code 2DAY at checkout. That's a good price! I REALLY like my Z2 Play, and I expect the Z2 Force to be even better that the "Play". Does TMobile let you unlock phones you buy in full, or do they still require service time first? This price drop isn't new. This "deal" has been going on for at least 4 months. It has been like this for a long time, and I heard it was at this price + free projector. It's a great phone, but not free of bugs. This is probably the most buggy phone I've ever had (it's not too bad, just that I never had such buggy phones before). With the bogo deals going on at T-mobile right now, I would just get a Samsung or LG. The LG G7 ThinQ is a much better option, and yea it's on bogo too. Never had any bug with mine.